Select a size: 5.07 Fl. Oz. Composed like our signature fragrances, this home diffuser oil fills any room with layer upon layer of intoxicating notes for months. 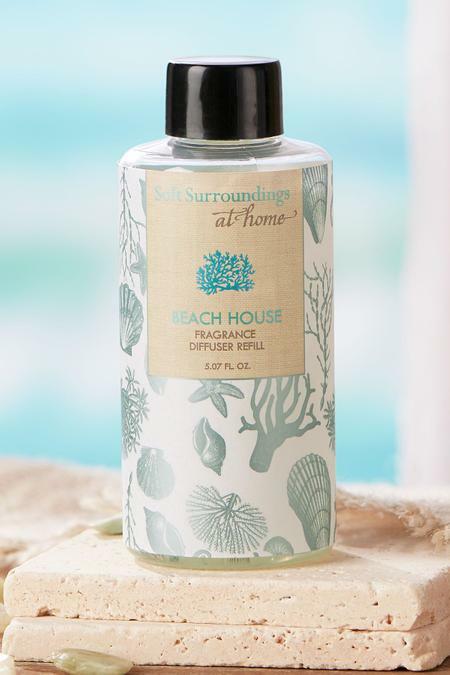 Our Beach House Scent features sparkling Pink Grapefruit mingled with contrasting notes of warm Amber. Bursts of fresh citrus, tart Lemon, juicy Lime and Green Florals. . For use with our Beach House Fragrance Diffuser. 5.07 fl. oz. Unscrew the cap of the refill bottle and carefully pour the oil into the fragrance diffuser vessel (sold separately). Insert ceramic coral. Not recommended for use with any other diffuser. Keep out of reach of children and pets. Avoid heat or flame. Handle with care. Do not ingest liquid. Avoid contact of liquid with skin and eyes as this may cause irritation. Avoid contact of liquid with furnishings, finished surfaces, plastics and fabrics. Spills should be cleaned up immediately as they may cause staining.